This is the second stage of the long-distance GR 131 path. 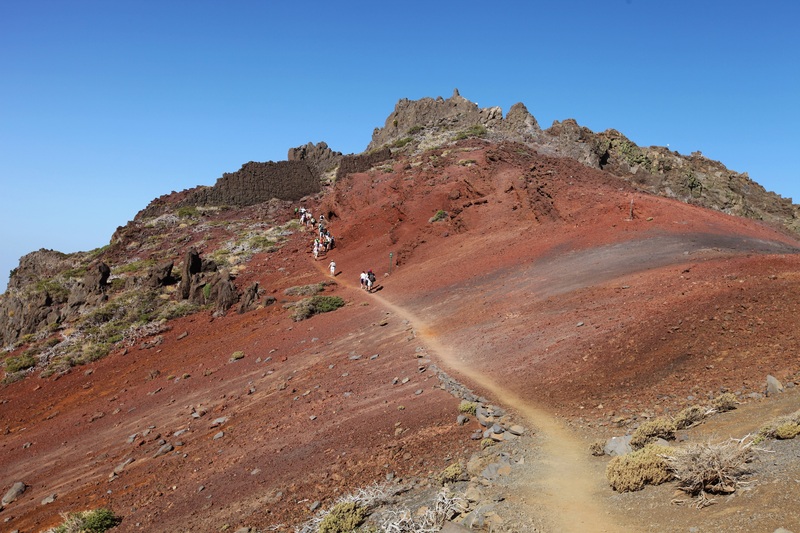 It runs through the highest part of La Palma, around the rim of the National Park, with impressive views into it, and towards both sides of the island. This section of the path starts from Roque de los Muchachos (2,426 metres) and finishes at the Refugio del Pilar Leisure Area (El Paso). The total distance is about 35 kilometres, with an approximate duration in the direction described of over 10 hours. However, variations exist such as climbing the section of the PR LP 3 to Pico de la Nieve, and continuing from there to Refugio del Pilar (about 7 hours). Along the way, a tagaror (meeting place of the prehispanic inhabitants) can be admired near Pico de la Sabina, and also pine trees with peculiar shapes. Special attention must be paid to weather conditions, as the path crosses high mountain terrain where mist, snow, and strong winds are possible. To reach the starting point, a private vehicle must be used, or a taxi (for example, the “green taxis” operating on the island). At the end of the route, once again, a private car or taxi will be required.The main recommendations are to take water, food, sun cream, hiking footwear, walking poles and adequate clothing. It is also important to obtain information beforehand about path condition and weather.